Walking into The Other Half is like stepping into another world filled with eclectic and exotic flora. 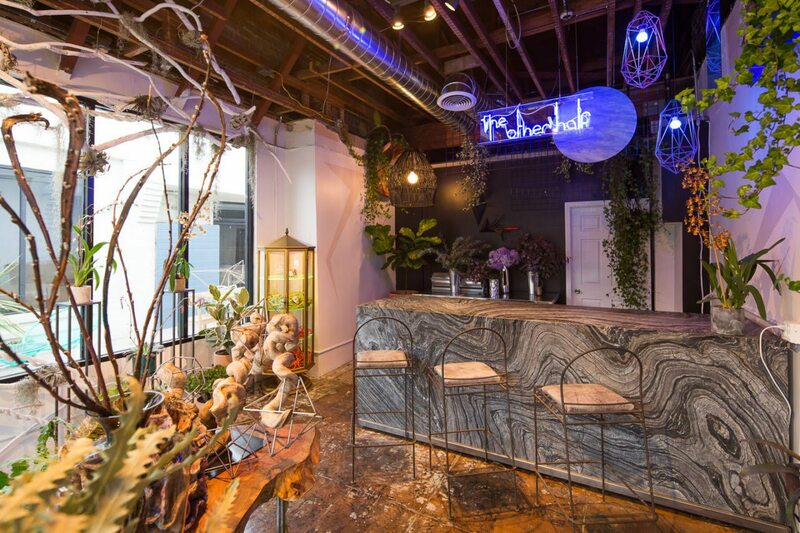 The newly-opened flagship boutique is located in the heart of LA’s Koreatown and is a destination for anyone looking for unique botanical art. The Other Half is not your typical run-of-the-mill flower shop. The location, with a colorfully painted exterior, invites visitors into its whimsical atmosphere acting as an installation work of art including color, scent and light. Here, you can find truly unique gift assortments all created by Nelson Pitts and his design team. After a decade working in NYC’s event design industry, owner and floral installation artist Nelson Pitts is now offering his work to the general public. With an extensive background in fine art, which Pitts studied through grade school and college, he initially developed his talent in botanical art after working at Spruce in NYC. Best known for his impressive installations for clients including H&M x Erdem, the NYC native is setting down roots in LA’s Koreatown in a beautiful and colorful design studio and retail space. The creative process behind his designs are fueled by his visual inspiration, which he utilizes when working on events with clients. Pitts and his team focus on developing unexpected concepts to create a truly memorable experience. The space serves as a studio for large-scale creations as well as offering truly unique botanical designs in a variety of options. Everything is made from locally- and internationally-sourced florals and plants and from top purveyors on a seasonal basis. Pre-made arrangements start at $45 and custom arrangements for delivery, starting at $175, include exotic florals, cacti and unexpected objects like crystals, painted sculptures and spray-painted florals. The studio and retail location also boast an 850-square-foot event space, where celebrations of each season including Equinox Events and in-store dinner parties will be held, and will also be available to host private parties. Orders can be placed online at www.shoptheotherhalfla.com for delivery within Los Angeles or visit the boutique at 3019 W. 6th St. Los Angeles, CA 90020. The flower pots you share are beautiful. you are very skillful. I really like these flower pots. Enjoy here for the work so please come here http://desktopiconswindows10.com/ and visit the more things for the work so please come here. Love discovering hidden gems in my city! Can’t wait to visit.